As I stood inside a small tent-like home constructed out of discarded materials on Friday I saw the hopeless eyes of desperation. 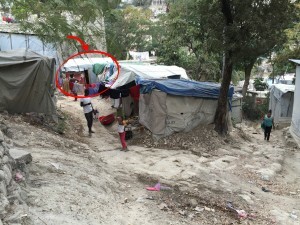 The home, constructed on a side of the hill along with countless others just out side of Port Au Prince, was hardly large enough to hold the three boys that lived in it, much less myself an two others from our team along with our translator. Their home contained very little by way of material possessions. On one side of the home, roughly the size of our walk-in closet, sat a mattress; on the other side was a broken and discarded wheelchair that served as a sitting area. A few clothes hung from the wood holding the structure together and a small burner sat haphazardly on the dirty, rock floor. The three brothers that lived in the home were survivors. Both of their parents were deceased, and they were just clawing to stay alive. They had no food and stealing was a way of survival for them. Running gangs were a sense of worth to them. They were tough to the core. Nestled around their tiny home sat countless other homes built from whatever other materials they could salvage. The people in these homes, who were also living with nothing, would often share the little food they had with the brothers just to keep them alive. The eyes of the brothers were desperate. This was not the first I’d met the youngest of the brothers that we found ourselves with. Earlier in the day, while visiting the school planted by i’mME in the community, the younger brother walked over to me and brazenly pulled the bracelet off of my arm to steal it. He then proceeded to try to sell my bracelet to others in our team. It was a survival tactic that was a second instinct to him. I willingly and joyfully let him walk away with the bracelet and was quite blown away to now be standing in his home. Back in their home we (myself and the two with me) took turns sharing of God’s love for them and of the salvation and hope we find only in Jesus. We told them they were valuable and that they had worth. We told them God loved them and wanted to rescue their hearts and restore their joy and hope. Tears rolled down their cheeks as they let down the guard of their tough exterior. As we finished sharing, Dex (one of the guys who was a part of our team) leaned over to me and said I should share with him what the bracelet actually represented. The bracelet the youngest brother pulled off of my arm earlier in the day was an “I am Second” bracelet. It was still on his wrist as his attempts to sell it were unsuccessful. I shared with him the truth that the bracelet represented. As I did so he removed it from his wrist as he stared at the white letters wrapped around the black silicon band. As I spoke his tongue rolled across his cheeks as he tried to fight back more tears, clinging tightly to the bracelet. As I finished, he slid the bracelet back onto his wrist and clung to it. Hope had collided with desperation. Throughout our time we were confronted with desperation that was beyond processing. From our visit to Cite Soliel, one of the poorest and most dangerous slums in the world, to our visit of an independent orphanage with conditions that would absolutely crush your spirit; our eyes were confronted with unspeakable darkness, hopelessness, despair and depravity. Yet, we continually got to see hope colliding with desperation. In the middle of situations that we knew we couldn’t help, nor change, we were able to see that darkness cannot exist in the presence of light. We were able to experience the reality that our environment and circumstances do not dictate God’s redemptive love and the joy and hope that can be found in Him alone. Desperation is real, and it is not a respecter of person. It does not matter if you live in the slum in Haiti or if you live in the house on the hill in the United States. But hope is real too; and it is as much for you as it is for three brothers trying to survive on a Haitian hillside. God is the same in poverty that He is in wealth. God is the same in sparsity as He is in abundance. This old earth is full of brokenness. There is hurt, there is pain, there is poverty, there is dispair…and there are not a lot of solutions to them. But I am reminded that we do have a promise that holds true. A promise that this world is not our home. A promise of eternal life because of His sacrifice. I am thankful for these three brothers, and for their lives. The scene will be forever etched in my mind. I am thankful that God’s love and Jesus sacrifice was for them; but that it was equally or me. I am thankful to them for reminding me that my circumstances don’t affect my position as a child of God. In the have, and in the have not, when desperation collides with hope…hope wins. I was humbled to be a part of an amazing team serving alongside the i’mME team. i’mME is making a dramatic difference in the Haitian community, allowing hope and desperation to collide. Giving our Haitian brothers and sisters a reason to keep moving, and a reason to serve God. I am also thankful for my own church family at Conduit, who first turned my heart towards the beautiful people of Haiti…preparing me for the trips I’ve made with i’mME. We may not be able to fix the temporal. But we can provide hope of the eternal. We can share the hope we have in Christ while helping meet the immediate needs of those in the middle of broken and desperate situations.